Intel officials revealed that notebook PCs containing the new Optane-flash hybrid will be timed to launch when Microsoft releases the next feature update of Windows 10. PC makers at CES have told PCWorld that they haven’t warmed to cutting-edge Optane Memory as much as Intel would have liked. But that hasn’t stopped Intel from innovating, most recently by combining Optane and flash memory on a single M.2 card. 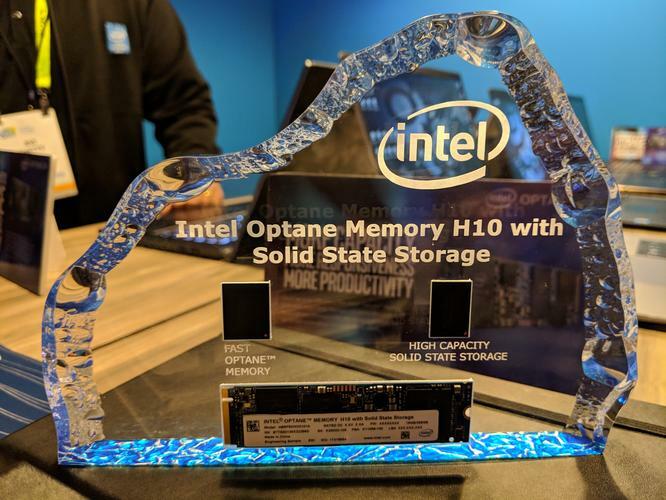 Eventually, Optane Memory H10 with Solid State Storage may yet be a boxed product that you can buy—that’s under investigation, according to Intel executives at a press conference here at CES on Tuesday night. For now, though, the H10 is being marketed at PC makers, many of which allowed notebooks using the technology to be showed off at the event. 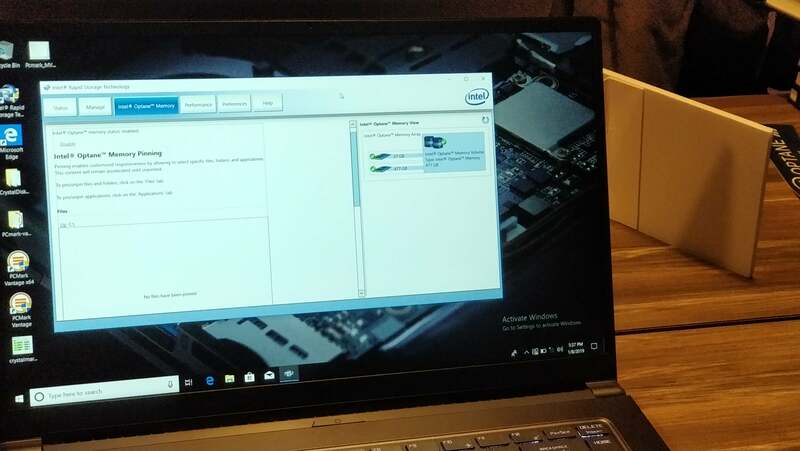 Intel’s Optane plus flash hybrid appears as a unified volume to Windows, but as separate drives within Intel’s Optane utility. 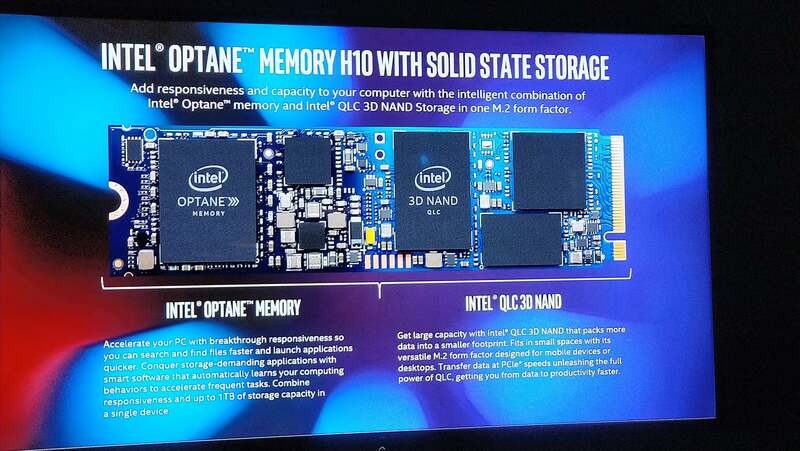 Optane Memory H10 will come in three configurations, Intel executives explained: 16GB of Optane and 256GB of NAND; 32GB of Optane and 512GB of NAND, and 32GB of Optane and a full terabyte of NAND flash. The flash used is QLC 3D stacked flash memory, Intel said. The super-fast Optane Memory intelligently stores your most-used programs and files on it instead of the traditional flash memory, greatly improving speeds in many scenarios. Intel said that the H10 was supported by Dell, Lenovo, HP, Acer, Asus, and more. Lenovo allowed an undisclosed ThinkPad notebook to be showed off with the Optane Memory H10 inside, and representative thin-and-light notebooks were also displayed, such as the Acer Swift 3 and Swift 5. Intel representatives said that the new H10 would be part of the “RS5” refresh of notebooks timed for the first week of April, according to their own sources at Best Buy and other retailers. “RS5” refers to a now-unused nomenclature of Microsoft, describing its ongoing feature updates of Windows 10. RS5 (now more officially referred to “19H1”) is expected in the first half of 2018, but Microsoft has yet to announce an official release date.